They came clad in t-shirts spanning his career, many clutching scrawled cardboard messages ranging from a simple song request to a more enhanced plea or comment. They came to pour adulation on a rock ‘n’ roll legend with the cast iron guarantee of not being disappointed. To be more precise, 37000 packed the stands and pitch of Coventry’s Ricoh Arena to witness a three hour fifteen minute exhibition of impeccable musicianship. The legacy of Bruce Springsteen has long been intact, but with each sold out show devoid of decline, and without doubt a wave of new fans, it continues to be strengthened. 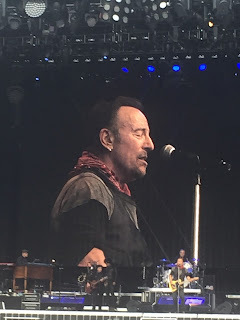 Amongst the throngs of lifelong devotees, there was the likelihood of many newbies spanning the generations and whatever the degree of Springsteen obsession, adulation filled the warmish air on this early June evening. It helps when the protagonist happens to be one of the greatest songwriters in contemporary music, is backed by a band soaring above its peers and they possess the charisma to turn a stadium into your local intimate venue. Sandwiched between the evocative solo delivered opener ‘For You’ and closer ‘Thunder Road’ were a further 31 songs predominately fuelled by the high octane presence of the E Street Band. The eight piece line-up had the usual players in place with the sax of Jake Clemons sharing the projected roles alongside the twin guitar maestros of Nils Lofgren and Steven Van Zandt. It must make Bruce’s job a damn sight easier to be in such stage company and thus spur on his energetic power to defy the sands of time. Just as the set list of each Springsteen show is glistening with expectation, uncertainty reigns supreme when seeking a highlight consensus. ‘No Surrender’, ‘Save My Love’ and ‘Travelin’ Band’ have a good chance of being the choice of three card waving fans, while general audience reaction to the usual suspects of ‘Born to Run’, ‘Hungry Heart’ and ‘Dancing in the Dark’ will likely float the boat of casual observers. To have a stab of a nigh on impossible job, I’m happy to reflect on five songs that just did that little bit more, some with describable reasons and others that just hit the spot . On what was The River Tour, the sixth song in, ‘Sherry Darling’ ignited the show from a personal perspective and led the expected healthy number of tracks featured from this iconic record. ‘Drive All Night’ also from THE RIVER left a favourable impression later in the set. 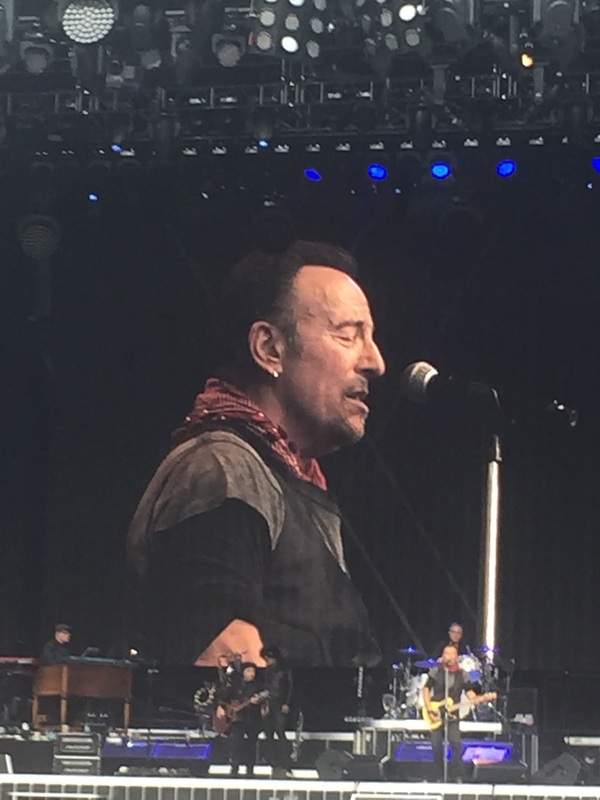 ‘Waitin’ on a Sunny Day’ was the pick of the feel good anthem numbers and as good choice as any to pinpoint Bruce’s skill of exhilarating a stadium audience. ‘Seven Nights to Rock’ was probably the highlight of the three covers, pleasing both its card waving supporters and giving a scintillating rock ‘n’ roll feel to the climax section of this outstanding show. If there was one defining moment on the evening, it had to be the brief thought during the performance of ‘Youngstown’ of finally finding the answer to the question, ‘what is Americana music?’. Maybe just a fleeting moment, but it summed up in three minutes what Bruce Springsteen is all about. In essence he is just a songwriter with a finger on the pulse of life, possessing the knack of transcending the line of exponential appeal and exploiting the attributes to flourish in that arena. This was my first Bruce Springsteen show and if it proves to be the only one, the privilege is immovable and has sealed the deal. It was an amazing experience to witness such a unique artist.